All the activities of the CIHEAM are based on a BOTTOM-UP COLLABORATION approach and are PROBLEM-SOLVING oriented, in relation with the specific needs of the countries. 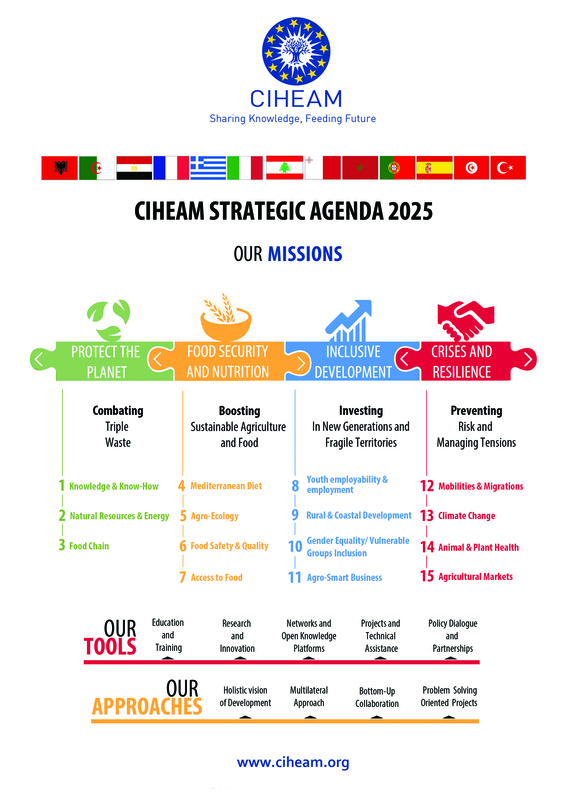 The CIHEAM's missions are structured around 4 PILLARS of developpement and divided into 15 THEMATIC PRIORITIES. The CIHEAM Strategic Agenda 2025 and its Action Plan are aimed at implementing the United-Nations Agenda 2030 for Sustainable Development, in the Mediterranean in specific fields. Protecting the planet “by struggling against triple waste"
- Sharing knowledge and defending traditional knowhow. - Managing natural resources and energy (water, soil, forests, energy, biodiversity, sea…). - Reducing agricultural losses and food waste throughout food chains. Food security and nutrition "by boosting sustainable agriculture and food"
- Promoting the Mediterranean diet. - Improving food safety and quality. - Increasing access to food. Inclusive development "by investing in new generations and fragile territories"
- Youth employment and life-long learning. - Development of rural and coastal regions. - Gender Equality and participation of vulnerable groups. - Emergence of smart rural territories and of inclusive agriculture and fishery models. Crises and resilience "by contributing to tensions management"
- Population mobility and migrations. - Climate change mitigation and adaptation solutions. - Animal and plant health. 3. Mediterranean empowerment action for youth and women in rural areas. 4. Training for zero waste in the Mediterranean - natural resources, food and knowledge. 5. CIHEAM affiliated centres: a tangible contribution to the European Neighbourhood Policy. Further detail on each initiative.